One of my favorite parts of hosting a party is developing the theme. I love thinking about components such as who we’re celebrating, what the occasion is, what time of year it is, and what would make it memorable to help me decide the right direction to take. I usually toss around a few ideas until the right one just sticks. And when that happens, it’s one of my favorite moments because then I can start fine-tuning the vision and bringing it to life! When it came to planning Katherine’s Baby Shower with my friend Rachel, we knew we wanted to really get the details right. 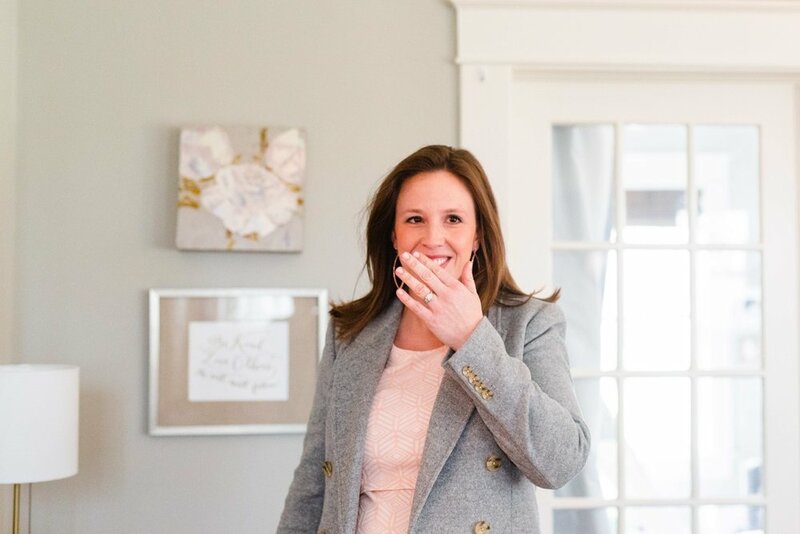 Katherine is someone who appreciates sweet touches, beauty, and design, so we knew putting our energy into these areas would mean a lot to her. As Katherine was designing her nursery, bunnies emerged as a subtle theme. It wasn’t over-the-top or even that intentional, I don’t think. She was just drawn to a few bunny elements and it started to develop from there. So, this is where we ended up landing for the shower theme, and I just love it! As with any theme, we wanted to steer clear from a cheesy or overdone approach. We wanted it to feel classic and “baby” as well as special and attractive. Also, Katherine was planning to incorporate a surprise gender reveal at the shower so we couldn’t be too gender specific in our decor. But, I do feel like there is always a little room to have feminine touches at a baby shower because after all, the Momma is a girl! 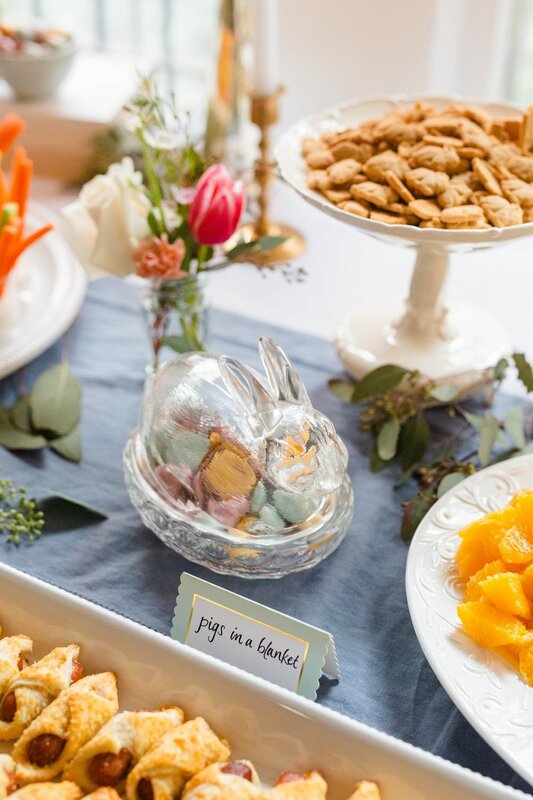 The sweet little bunnies, greenery, and linens made for a perfectly charming and meaningful day. I’ll share a few details as we go, too, in case you want to replicate anything you see! Enjoy! 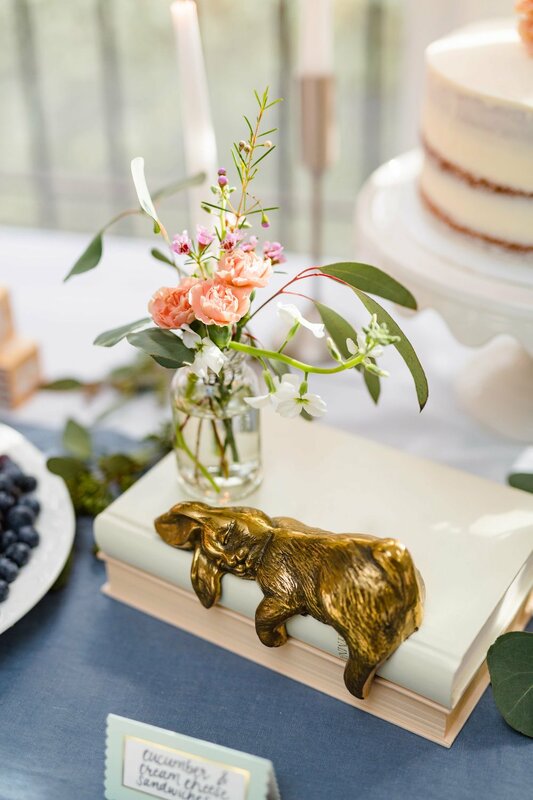 We found these adorable little bunnies at Michael’s, and they were a subtle surprise in our flower arrangements. 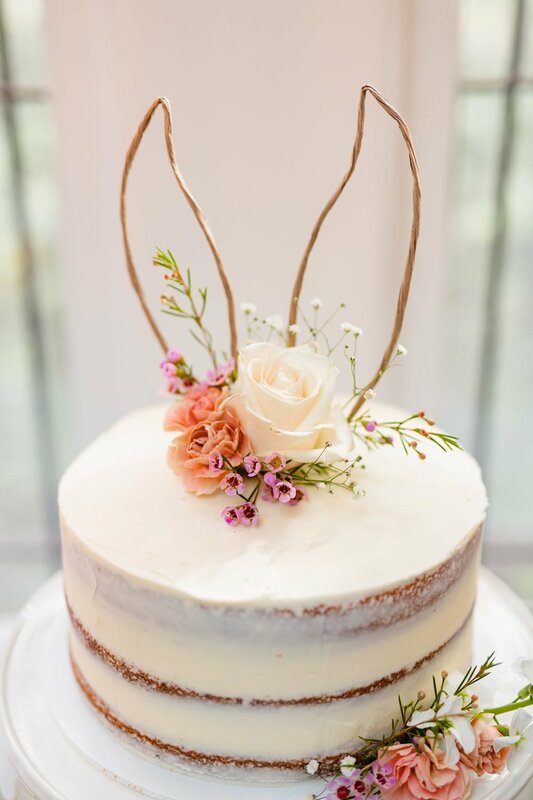 Rachel found inspiration for the greenery bunny online, and we used floral wire wrapped in paper, floral tape, and fresh greenery from Trader Joe’s to create our own! Then, we accented it by using floral hoops in different sizes with ribbons hot glued and greenery wrapped with floral tape. It was whimsical and sweet. Y’all. This cake! I can’t even. I loved it so much! It was delicious for one, but also so perfectly lovely I could squeal. Our favorite local baker, Bec’s Cakes, created this wonder and took the bunny ears we made to finish it off! We saw the idea online and shaped these bunny ears out of the same paper-wrapped floral wire we used for the large greenery bunny. 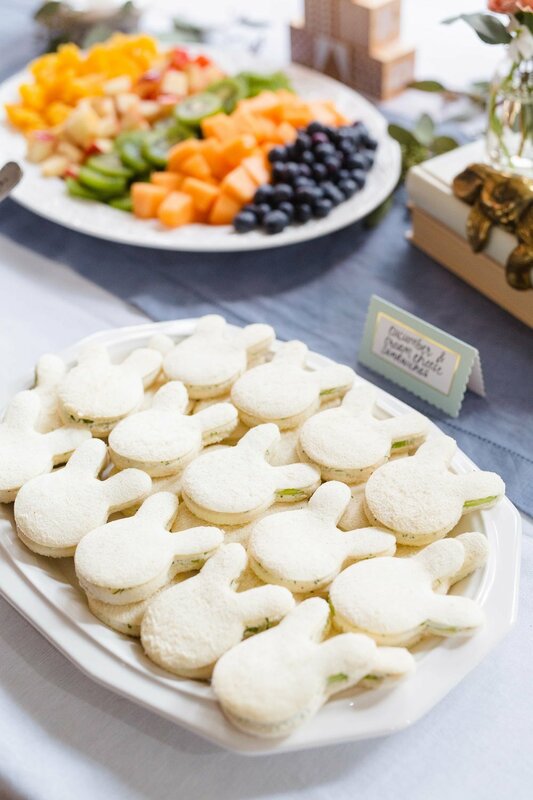 The bunny cucumber and cream cheese sandwiches were as tasty as they are cute! A perfect touch for our mid-afternoon celebration. Katherine loves to read, so when we found this antique bunny made to rest on books, we knew we had to get it for her. It doubled as shower decor and a gift, which is always fun! Sweet Katherine. This image just gets me. We were all so excited to celebrate her and Baby Stone, and to see the look on her face when she walked into her shower was the best. 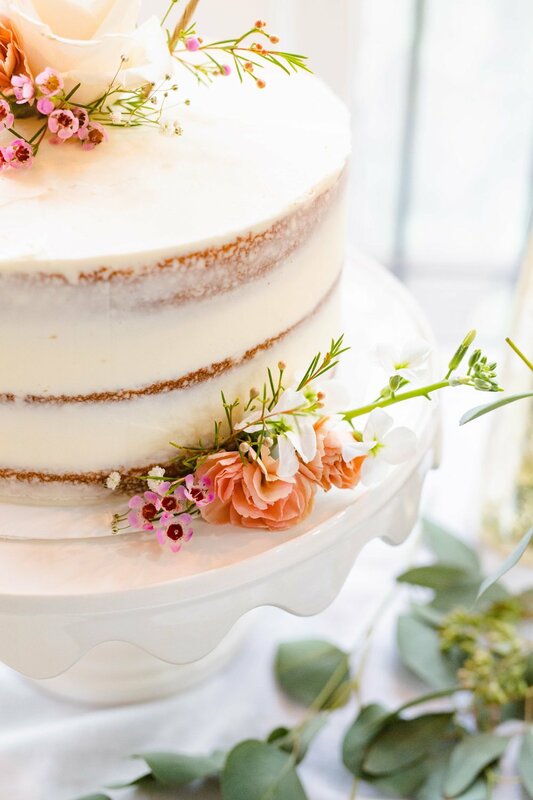 There’s nothing like putting your heart into a celebration for someone and them receiving all the love you hoped they would through every detail. You can see the delight and surprise on everyone’s faces as they heard this exciting news! It was such a special moment and such a special shower for such a special friend. We love books in our house! We’ve been reading to Fox since he was a baby, and one of my favorite parts of motherhood has been watching him experience books with such delight. I also look forward to sharing the joy of books with Mae as she grows, and I hope she will love them, too! We typically read 1-3 books at night before bed and often at other times throughout the day. As Fox has gotten older, it’s been fun to see which books he loves most and watch him interact and recite parts of the stories. There are so many books out there, and our favorites ebb and flow in seasons, but there are a few that stand out to me right now that I think are worth adding to your child’s collection or selecting as a gift. I’m sharing our top picks by category, and I hope you find a new book to love on this list! Also, I’d love to know—what are your favorite books for babies and toddlers? Which ones do we need to add to our bookshelves? Will You Be My Sunshine? Affiliate links are used in this post! The birth of Mae began my second adventure into “newborn life,” and I’m learning so much. I knew it was true, but there is nothing like having two babies of your own to prove to you that every baby is different! Mae is her own person, and being a little more relaxed this time around is allowing me to enjoy learning her and figuring out what she needs with more ease and confidence than I had as a brand new mom. Part of this process has included identifying some key items that have become “must-haves” for us, and when I find something I love, I gotta share it. There are SO many items out there for Moms and babies, and sometimes it’s helpful to have a friend help you wade through the masses to pick out a few treasures. This is not intended to be a comprehensive list of ALL the things you need in newborn/postpartum life (although here’s a little tip—what you actually need is most likely less than what you think you need); I simply want to highlight the items that are either new favorites or have become trusty go-to’s with both babies for us. I’ll say it again, every baby is different, so you have to figure out what works for you, but my hope is that each Momma will be able to find at least one gem from this list! 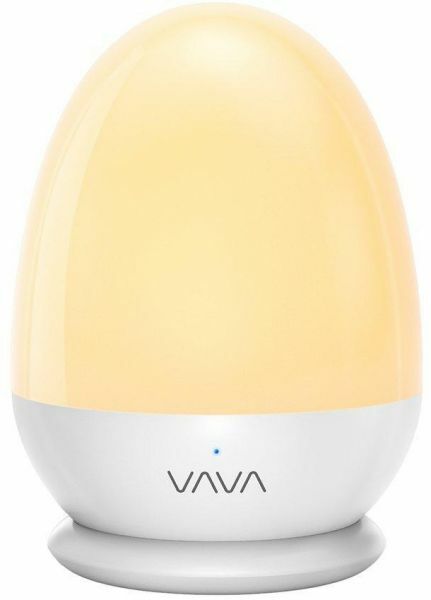 I think I will get this nightlight as a baby shower gift for people from now until forever. This thing is amazing! It’s chargeable (and the charge lasts for days/weeks depending how often you use it), portable, and touch-activated making it incredibly convenient. It has two different light temperatures and is dimmable, too. It’s wonderful for late-night feedings and diaper changes when you might not want to make a lot of noise or have a lot of light. It’s also great to travel with if you’re unsure what kind of lighting situation you’ll have. We have loved the Boppy Newborn Lounger with both babies. It’s lightweight and has a handle so it’s easy to take from room to room or on a trip. It’s a cozy spot for baby with a slight incline so their head is lifted and they can see what’s going on around them. Mae sits in it happily while I’m getting ready, cooking, pumping, you name it! Because it’s so easy to put anywhere, it allows me to be close to her when I’m not able to hold her, and that’s something we both love. I really can’t imagine newborn life without it. I also wanted to give an honorable mention to the Dock a Tot. We’ve used it with Mae, and so far it’s been great. It’s a pricier item, so we were thankful when a friend offered to loan us theirs. It’s lightweight and easy to transport just like the Boppy lounger, and it’s nice when you need a portable, convenient sleeping spot or to let the baby lay flat and kick around. I don’t think I would pay full price for one, but since we got to borrow this one, I am glad we have it. This four-in-one cover is one of my favorite items. Both my babies were born in cold weather months, and this is wonderful to put over their car seat to protect them from the cold air and germs. I imagine I would use it in the summer too because it would block out light and any hands that want to reach in to touch baby. Also, it’s a lightweight nursing cover that I take everywhere. It took me a while to get used to using it with Fox, but with Mae it’s been so helpful. Someone actually referred to it as my “magic striped blanket” because every time I pull it out she gets calm (a.k.a. she gets to eat)! These burp cloths are so soft and ideal in size. With Fox, I had all different kinds of burp cloths, and I ended up only wanting to use my favorites. This time, I have 12 of the Burt’s Bees and I never have to question if I’m getting a “good one” or not. It removes any decision making and keeps me well stocked with burp cloths (a MUST in those early months!). As cheesy as the name may be, this has truly been a good friend for me with both my babies! I like this nursing pillow because the firmness of the pillow gives me and my baby quality support, the buckle helps it stay in place, and its soft. The pad around the back is so comfortable, and especially as my babies have gone from newborn to bigger babies, the My Brest Friend gives me much needed relief for my back, shoulders, and neck during nursing. There are many baby wraps out there, and I’ve heard positive reviews of many of them, but the Solly Baby Wrap has been the winner in our home. I wasn’t very confident using it with Fox so I only used it a handful of times, but I’ve already used it dozens of times with Mae. It calms her down when she is fussy, and she takes a nap in it almost every day. It’s also really helpful as a mom of two because it gives me free hands to love on and care for my toddler while also keeping Mae content and getting little newborn snuggles. I love getting to be near my girl while having the option to have my hands free. Newborns tend to have fast-growing, sharp fingernails that are hard to cut, and these sleepers make protecting them and you so easy! I especially love using these at night when she might scratch her face the most, and they’re also nice when nursing so she doesn’t poke me with those sharp little nails. After two months of tiny little socks falling off Mae’s feet constantly, I finally bought these Zutano booties with an Amazon gift card we were given, and they’re fabulous! They stay on her feet so well and keep them warm. 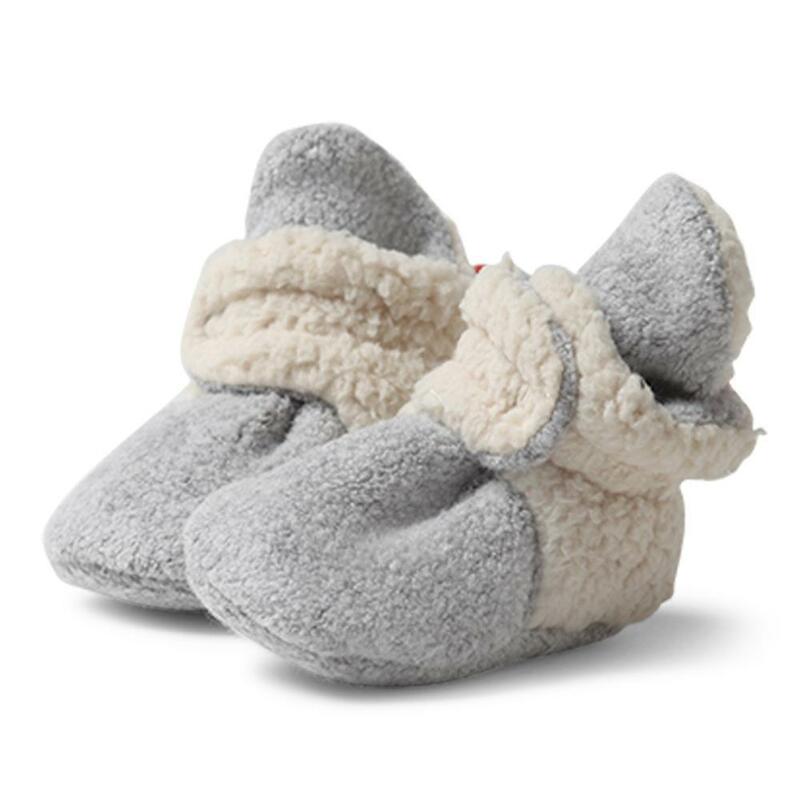 I got the fuzzy style for her first pair since it’s winter, and I plan to get the cotton ones for spring/summer. A friend recommended this pump, and I was very intrigued because she said it helped her express more milk and was quieter than other pumps. I still had my pump from Fox, and figured if I wanted this new one, I’d have to buy it or receive it as a gift. Then, a friend who saw it on my baby registry told me she got the same one and it was covered by insurance. After looking into it, I was so delighted to see that my insurance covered it, too. With her recommendation, I ordered it through Aeroflow, and it was a pleasant, streamlined experience. I love this pump for many reasons: it has a massage mode and expression mode to help simulate how your baby eats, a handle for easy transport, a timer to see how long you’ve been pumping, a nightlight, and two options for adjusting the frequency and intensity with which it expresses the milk. Also, it doesn’t hurt that it comes in pretty colors. In my second season of nursing, I have been much more savvy with my nursing bra situation. I have lightweight bras to wear at nighttime and more structured bras with better coverage for daytime. But, my favorite one by far is this one by Gilligan & O’Malley of Target. It is comfortable enough to sleep in, but also has enough coverage and structure to wear with clothes (and I think the color is pretty!). It appears they have limited quantities remaining, but I’d recommend this brand overall for comfort and price point. A friend and fellow Momma who happens to be a nurse gave this Witch Hazel to me at my baby shower for Fox, and it’s been a staple for me both pregnancies and postpartum. Its very helpful for postpartum healing (specifically for a vaginal birth), and it’s an overall great way to clean and soothe sensitive areas. I have used both the bottle and these pads (which are the same ones they gave me in the hospital). These are an obvious item on a pregnant and postpartum woman’s list, but I just love this brand so much I wanted to share. I have used them in both my pregnancies and postpartum, and they’ve worked well for me. 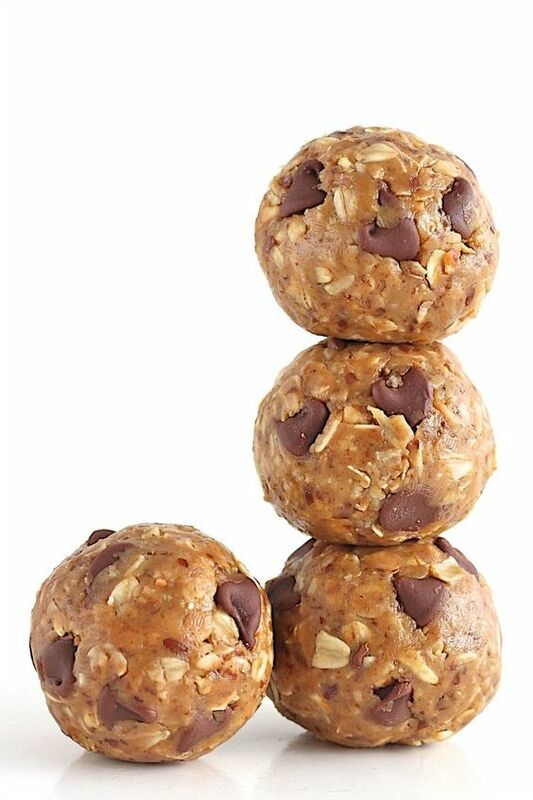 I think I ate my weight in these lactation bites after I had Fox, and I’ve loved them with Mae, too. They taste delicious, have ingredients to help with milk production, and are great snacks when you’re starving but don’t have time to eat much or its the middle of the night and you need something small and quick. So, there’s my list! I imagine it will be ever evolving, but I hope it’s helpful. I’d also love to hear any favorites you have that I should try! Three days past her due date, we were filled with joy and excitement to welcome our daughter, Mae Elizabeth Woodcock, on October 30. Fox came early, so reaching and surpassing my due date and knowing the “baby could come any day” was new territory for me. Everyone kept asking if I was so ready for her to come, and honestly, I was patient. I was excited to meet her for sure and ready to have some of my pregnancy discomforts subside, but I knew she was coming soon, and I felt patient for the right timing. Honestly, I was mostly concerned about what her actual birth day would be. Expecting an October baby for months, I was hoping she would be born in October, but not on Halloween. I had a feeling she would be born in the 20’s (and actually had guessed the 26th), but she came just out of the 20’s and just before Halloween, with a perfectly round numbered 10/30 birth date. It was perfect. With my Dad hanging with Fox, Woody and I went to what would be my final pre-baby appointment at 40 weeks, 2 days, on Monday, October 29. I was 3 cm dilated, and we made a plan for me to come in for a stress test November 1 if she hadn’t made her appearance yet. In addition to Halloween, I was also hoping she wouldn’t be born on our anniversary (November 3), but both were certainly possibilities at this point. I went to sleep that night and woke up at 3:55am, repositioned in bed, pulled my knees up to get cozy, and there came the gush. About three to four gushes to be exact. I turned on the light and sat up, went to the bathroom, and confirmed that my water had broken. With the breaking of my water, my adrenaline quickly kicked into gear. I felt excited and energized that this moment we had waited for was here! I woke Woody up in the process, and after we talked about what was happening, he asked if he could go back to bed. Ha! I think he was remembering the lengthy labor process with Fox (about 30 hours total) so it was an understandable question. With Fox, we had both slept after my water partially broke in the middle of the night, but this time my body was moving along much faster. I could already tell a slow morning to labor at home was not in the cards, and going back to sleep certainly wasn’t for either of us. Contractions picked up quickly, already averaging about five minutes apart by 4:30am. My excitement turned to focus as labor was intensifying and I was trying to breath through it. I told Woody to go ahead and call my Dad so he could be at the house with Fox. Then he called the doctor on call who told us to head to labor and delivery. My plan had been to labor at home as long as possible, but as my labor quickly progressed and I got more uncomfortable, I was ready to be settled wherever I was going to be to give birth to our girl. It felt like it took forever to gather my few remaining hospital items between contractions. It was hard to focus on anything but labor, and I kept having to stop to breathe through a contraction. My Dad arrived at some point in this process, and at 6am, we left for the hospital. My Dad wanted to take our photo as we left for the hospital because he knows me well and knew I’d want it later. I was smiling here, but I remember at the time this was the last thing I wanted to do! I was just focused on what was happening in my body. Upon arrival, they sent me to the OB Emergency Department to examine me and confirm that I was in labor (a fact I very easily could’ve confirmed for them, but I know, I know, it’s part of the process). Once the doctor checked, it was confirmed that my water had definitely broken and I was 6 cm dilated. Yay! Finally my nurse, Amber, came to get me and take us to our room where I would labor and deliver sweet Mae. As I had with Fox, my hope was to have a “natural birth” (no epidural) with Mae as long as my body and my baby would cooperate. Having done it before wasn’t as comforting as I thought it would be, and instead I felt intimidated and unsure. It was hard to focus on getting through the moment because I was thinking about what was to come and fear crept in. Also, with this labor moving more quickly, it got intense faster, which was a new experience. There were times I looked at Amber and Woody and said, “I can’t do this,” but they were so supportive and encouraging to help me push through. I also took advantage of some medicine they offered to help dull some of the pain. I could still feel it all, but kind of like laughing gas at the dentist, it helped calm me and ease me through the contractions. It only lasts about an hour and half, but it provided some very welcome relief. I’ve learned that when I am in labor, I do not like to move around. I like to get in one position and stay there. I was most comfortable with my legs stretched out and my back leaned against the elevated bed. There were times I tried to stand or walk, but that it made it more painful. I even labored on the heated toilet seat, but overall couldn’t stay there long. One time they rolled my bed over to the bathroom so I wouldn’t have to walk across the room, and that was wonderful. The hospital had a doula on staff, and she came to help with my labor, too, and I was so grateful for her experience and guidance. She suggested different positions and breathing that I did my best to try, but I just wanted to sit in my same position. With the sitting position I preferred, she helped me tilt my hips to better open up the path for Mae to come, and I feel like it made a difference. The contractions started to really be one on top of the other with little to no break in between. 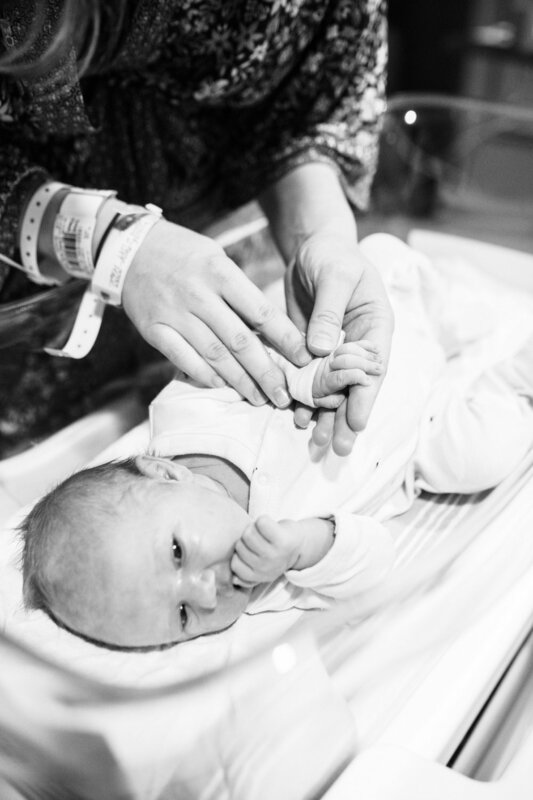 I can remember the nurses and doctor trying to ask me things or talk to me, but it was difficult to do anything but focus with eyes closed as I breathed through each wave, the intensity signaling that my baby was coming soon. I finally got enough of a break for my doctor to check my dilation, and she said “I can’t feel any cervix at all, she is fully at a 10.” I was glad, but the pushing was one of the hardest parts for me with Fox, so I knew there was still some work ahead of me to get baby girl here. I did not want to deliver on my back if possible because that position was challenging for me when I delivered Fox. The process of turning from my back though was one of the hardest parts of labor. Being on my side was excruciating and I just kept crying “Help me” to everyone in the room. I could feel the pressure of her coming and it was the most desperate I felt throughout the entire process. Knowing this was my final chance to get my little girl here without medical intervention, I dug as deep inside as I possibly could, mustered every bit of will and physical strength and pushed a few more times and delivered Mae. I so clearly remember the mix of pain and relief as I felt the smooth, but stretching sensation of her head coming out and then the wobbly feeling of her shoulders and body to follow. It was a miracle, and she and I had worked together to do this. She was here! It was a delicate turn to get me from my knees to my back since the umbilical chord was still attached, but we did it, and within seconds, I laid my eyes on my daughter for the first time. The first thing I thought was, “you’re so beautiful!” She was feminine in her features and sounds, and meeting her is still one of the most awe-inspiring things I’ve ever experienced. I feel like I want to give a speech like an award winner and thank all the people that helped me. But first, I want to honor and thank Woody. He was incredible throughout the entire labor and delivery. I know that what I did was hard, but I think his job is hard too. He stayed by my side, helped communicate on my behalf, and kindly coached me as I labored. He felt so close to me, and him by my side is one of my most vivid memories from that day. I also am so grateful for my nurse, Amber, the doula, and my doctor as well. I know they experience babies being born all the time, but as a Momma, there is something about the people who help you bring your child into the world that makes them extra special people in your life and memory forever. From the beginning, it truly does take a village. If you’ve made it this far, thanks for reading! And, if you’re an expecting mom, let me just encourage you—you can do it. Birthing a baby is both one of the hardest and most cherished things I’ve ever done and probably ever will do. There are so many ways to safely bring a baby into the world, and as you read other people’s stories, remember to make your choices based on what matters to you and what is best for your family. There is no prize for delivering a baby this way or that, and every story—every mom, every baby, every pregnancy, every birth—is unique. You can read more about how I made decisions for birth in this post, but most of all, do what is right for you and your baby. As always, I’m cheering you on! Do you have a birth story you’ve shared somewhere? If so, I’d love to read it, so share in the comments! I recently saw a pregnant Momma ask on Instagram for advice as she becomes a first-time Mom, and as I went to write her a response, I realized I had a lot on my heart to share. I’ve been thinking about the transition of welcoming a new baby myself as we’re about to have our second little one, and in the midst of that I’ve felt an almost gravitational pull toward new Mommas. It’s not because I think I’m an expert or have some magic secret to share, but it’s because my heart is so tender toward this season of a woman’s life. I want to give the Moms I see a hug, invite them to take a deep breath, look them in the eye, tell them what an incredible job they’re doing, and encourage them to let go of all the pressure they’re putting on themselves. I expect that much of this comes from the fact that it’s what I needed more than I ever realized in my first months of motherhood. I’ve learned so much since Fox was born, and I can only imagine all there is yet to learn. Let me paint a little picture of myself for some context. I’m a creative, an idealist, and a hopeful romantic. I love when this all comes together for dreaming big dreams, making things special, and loving people well. I don’t love it when this all comes together in the form of unrealistic expectations, pressure to be perfect, and focus on things that aren’t what matter most. As you might imagine, with these qualities, approaching the birth of my first child I was really feeling the pressure (from myself) to live up to this grand life experience. I felt like I needed to know all the things, do all the things, and prepare all the things so I could be the perfect Mom for my perfect baby. Like. that. matters. Lord, help me. In my attempt to control everything to be “just so” I came undone. This is why my heart is so tender, and part of why I’ve felt such a conviction to speak life and truth to other women in this season. After feeling all of this for months, reading that gal’s Instagram post finally pushed me over the edge to sit down and type out what is on my heart to say to you (to us), sweet Mommas. But someone is—remember God’s got this. He goes before you, and He has created you to do this. He chose you to be this baby’s Momma. This baby whom He loves more than you ever could (which will seem incomprehensible most of the time), and He has entrusted His little loved one to you, for a purpose. You will doubt that at times, but it won’t make it any less true. The world is full of information, directions, and formulas. Don’t let all the rules and opinions rob you of enjoying your child and of being the Momma you’re called to be. Your heart can tell you how to calm their cry better than any book. Your prayers can be tailored to them better than any sleep schedule. And you will be loving them longer than any parenting method’s popularity lasts. You’re learning to be a parent just as they are learning to be a baby. You won’t do it perfectly, and that’s part of the beauty. And great doses of grace are good for us. Allow yourself heaps of grace, extra long snuggles, and tears when they come. Cherish the moments for they only last a season. The changing seasons aren’t something to fear; they’re something to embrace. The growing, changing, and loving becomes more rewarding with time. Sit back and receive the gift of your little one. You’ve got this because God’s got you. I’m cheering you on, Momma. We thoughtfully designed his nursery to work for his newborn days and to grow with him, so many of the elements will stay the same. We're adding a few touches and new items to fit the new space and/or to replace things that are staying in the nursery like the rocker and dresser/changing table. Here is some of the original inspiration for his nursery, and collectively I feel the images reflect the design of his room pretty well. For his new room, I want to add a few touches of color as well as some more play items. These are the items that are currently in his nursery that will be making their way into his new room! Fox's new room is larger than the nursery, so we needed a larger rug. The rug we love in the size we need was more expensive than we wanted and not very plush. We went with this very highly reviewed natural rug, and we'll layer a smaller version of the blue rug we love on top. It's the best of both worlds! Sometimes working within a budget leads to an even better solution than you might've reached with unlimited funds. In our home this means Momma (stickler for style) and Daddy (stickler for budget--with an eye for style, too!) are both happy. Since the rocker will stay in the nursery, we need a new chair for Fox's room. We spend a lot of time reading in his room so it's important to have a space to continue to do this as he grows. We were so excited to get this floor sample chair at a great price from one of our favorite local furniture stores. It's in a pattern we love and that works great with the style of Fox's room. 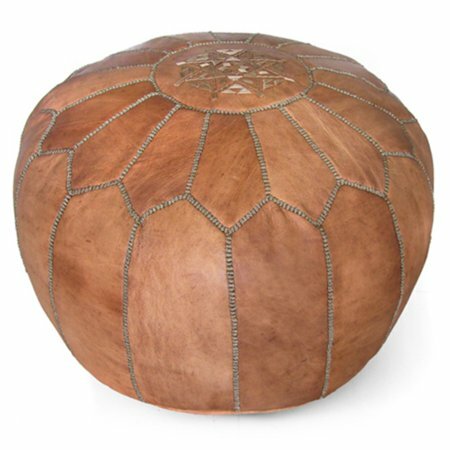 We ordered this leather pouf a few months ago, but since Fox's room isn't ready for the new items yet (it's still operating as a guest room/office/catch-all), we've been using the pouf in our living room. Woody and I are both thinking we're going to have to get another one because we love it so much! I also want to get some floating shelves for his reading nook, and I haven't decided if I'll move the ones from the nursery or leave them and get new ones for him. I love these Pottery Barn ones, but found a more affordable option at Target. I'm going to wait to decide on shelves until we're further along with the rooms. We never ended up with curtains in Fox's nursery, just the matchstick blinds we already had in there. The blinds work great with the style of his room, but we're to the point where we want to invest in some blackout curtains for him. He's never had blackout, and I've always thought it's probably helpful that he's accustomed to sleeping in a space that isn't perfectly dark, but his new room lets in more light, and I want to make sure he has a cozy place to rest and sleep. Finally, I want to add some fun, playful elements for our active, growing boy! I'm going to put this teepee on his Christmas list hoping a grandparent may want to gift it to him! I don't know why, but I just love this little alligator! It's such a fun pop of color, and I hope he'll enjoy playing with it! Well, there you have it! We're getting closer to having his new room cleared out of guest room/office/catch all items, and I am giddy to get going on this project! After I've spent time designing, researching, and imagining, I'm ready to see it all come together. Most of all, I'm ready to see Fox enjoy his new space that will better fit the stage he's in and the stages to come. Initially, it was hard for me to imagine moving him out of his first room, but when I realized how fun this could be for him I felt much better. Once the space is done, I'll share how it all turns out! If you have any tips to share for transitioning a child into a new room or things to consider for a toddler room, I would love to hear! When it comes up in conversation that I had an unmedicated birth with Fox, people usually respond in similar ways, "Wow, you're my hero. That's amazing." It's certainly a nice sentiment, but I usually respond with "That's very kind, but if there is one thing being pregnant and giving birth taught me, it's that there's no easy way to bring a baby into your family. Whether natural, epidural, c-section, or adoption, there are hard things about all of them." Having a baby is a special and intimate experience, unique to each woman, child, and pregnancy, and while an unmedicated birth was a great path for our family, I don't consider "natural labor" to be the sainthood of childbirthing that its sometimes treated to be. The truth is, while its valuable to be educated and have plans (or hopes) heading into giving birth, we simply cannot control it. I am so grateful that my body and my baby cooperated with a natural labor, but I know that's not always the case. It can be hard not to have hopes or expectations about how birth will go, but what I try to keep at the forefront of my mind is that I want a healthy mom and healthy baby most of all. Also, while there are some medical interventions that would not be my first choice, I'm so very glad I live in a time and place where those options are available and safe. Before I continue, let me also say that nothing in this post is intended to offer medical advice. This is simply my thought process and my story. As always, you should definitely consult a medical professional for any of your birthing decisions. My mom had both me and my sister without medication. When she had me, she said that the hospital wouldn't even give her the epidural until she was dilated 7.5 centimeters, and at that point she figured she might as well just go all the way. With my sister, she had a natural labor with a midwife and home birth. She says that if she had ever had another baby, she would've chosen a home birth again. My sister and I are 10 years apart, so I remember a lot about the beginning of her life, including my mom's birth plans. Having always known my mom had natural labors, it was an option that stayed at the forefront of my mind. In the months and years leading up to getting pregnant, and certainly once I was pregnant, I really had to do some digging into my motivation for choosing a natural labor. Was it to "fit into a club?" Reach a goal? Impress myself? Impress others? Do what I think was expected of me? Deep down, I was scared that I couldn't do it, and that maybe I didn't want to. However, over time, and through research, I realized that a natural labor actually was the most appealing to me. If I could help it, I preferred not to undergo the surgery of a c-section, and the epidural didn't sound appealing to me either. I didn't like the idea of the needle in my back, not being able to feel what was happening, being numb after birth, or the possibility of it not taking at all or only partially working, all of which I only knew about from friend's experiences or what I learned in birthing class. Probably the thing that confirmed my decision the most was that I did not talk to a single person who'd had a natural birth who wouldn't choose to do it again. Having never given birth, I wasn't sure what to expect, but that caught my attention. On that note, I certainly had many friends sing the praises of the epidural so I wasn't completely closed off to that either (again, with no experience in giving birth, you can only think about it so much because you just don't know the full story!). So, my plan going in was to go natural as long as I could, and if at any point I felt like we needed to get the epidural I could. Also, if I ended up needing Pitocin to help my labor progress, I was pretty certain I would elect to have the epidural because I've heard contractions on Pitocin are very intense with little break in between, adding another factor to going natural. And, with my main goal of healthy mom and healthy baby, I certainly would not deny a c-section if it were the best way to keep both me and my baby safe. My labor was long, but healthy, and Fox never showed any signs of distress. Now that we know his personality (calm and content), that is not surprising at all. Unmedicated contractions and pushing were certainly intense, and I do remember asking Woody, "why did I say I didn't want the epidural?' and at one point telling my nurse that maybe I should just get it. Both of them, very in tune with my heart in the matter, were so supportive and encouraged me to keep going, and looking back, I'm glad I did. Fox had a healthy arrival, and once he was here, any pains or discomfort from my labor seemed to fade into the background. All of the sudden, what had felt so intense and all-consuming seemed like a small thing compared to the enormity of meeting our baby boy. As for our Baby Girl due this October, I'm hoping to have an unmedicated labor again. My heart is in the same place as before: healthy mom, healthy baby is top priority. I'll labor unmedicated as long as my body and baby cooperate, and from there, we will pray and make the decisions necessary to safely deliver our daughter into our arms. Ask questions, gain knowledge: The more I know going into it, the more equipped I will be to ask the right questions and take the best steps for me and my baby. Don't compare myself to other women: My story is my story, and I know God has a plan for this baby and this birth. As much as I may be familiar with other people's stories, I don't know the whole picture, and making such important decisions out of comparison will not be helpful. Be empowered: I trust the doctors, and I also know that I am my best advocate. I don't have the knowledge or experience they do, but I can ask questions like "what would happen if we don't take that route?" or "can we wait to decide for 30 more minutes?" or "are there any other options that are safe to consider?" Be flexible: We just can't control all the aspects of childbirth. Being informed, empowered, and asking questions will help me, but at the end of the day, maintaining flexibility is so valuable in staying calm and focused on the priority of delivering my baby in a safe, healthy way for both of us. 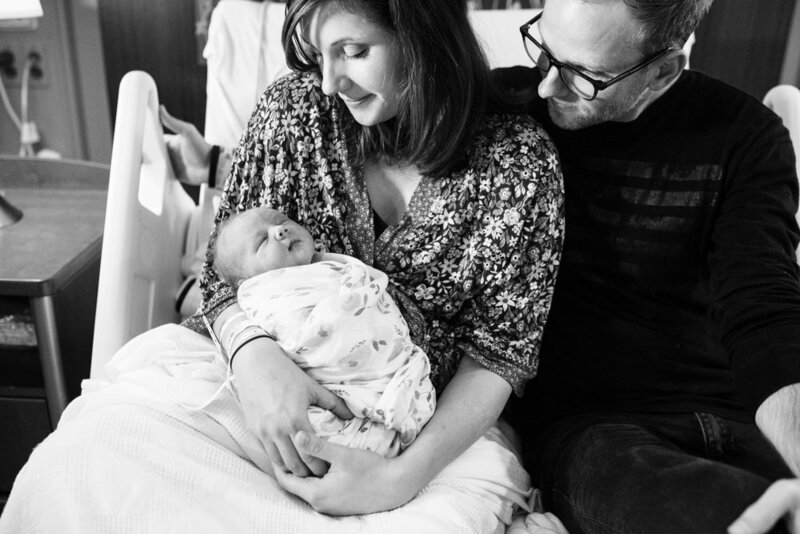 I hope my story helps encourage you as you think through and prepare for labor and delivery. It truly is a beautiful thing and an amazing gift. God made our bodies to carry and deliver babies, and I believe there is nothing to be afraid of. As always, to the new mommas, longtime mommas, hopeful mommas, expectant mommas, and future mommas, I'm cheering you on! 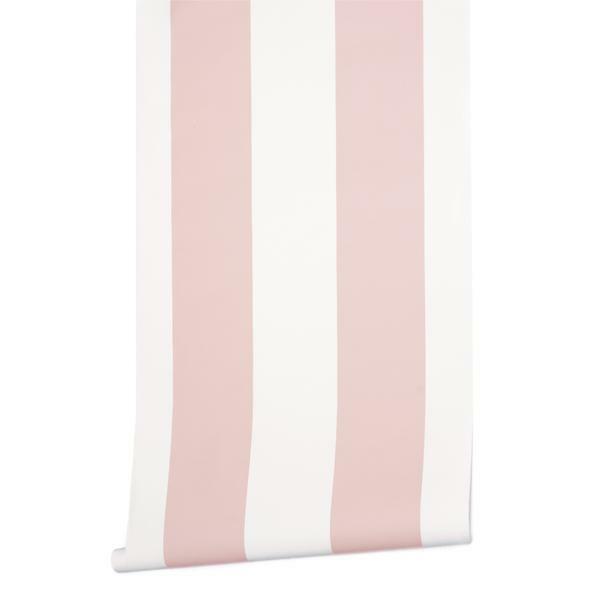 I feel like I'm in my element designing a nursery for our baby girl. 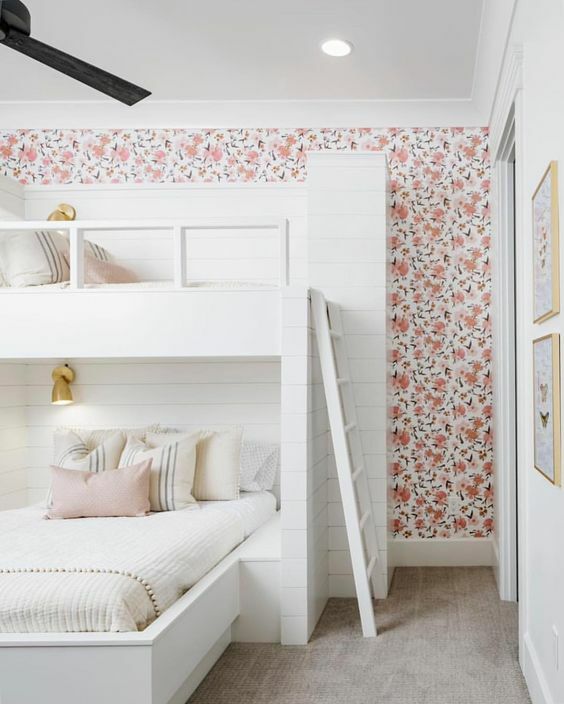 While Fox's little boy nursery was a fun design challenge for me, as a longtime lover of florals, romantic colors, and feminine touches, the only challenge for a girl nursery is how to narrow it down! One thing that I've learned is that you can't have it all, so its helpful to pick the items you love the most (anything you feel that you "can't live without") and build your design from there. For Baby Girl's nursery, this ended up being a floral bouquet fabric from Fireflies and Fairytales that I just couldn't let seem to let go. This fabric (shared below) gave me a good feel for colors and overall feel, and I was able to pick up items here and there that would work. I'm also a firm believer that if you pick out things you love, it will all work. Of course there are styles and colors that work better together, and I always consider that, but filling a space with things that light your heart up is one of the truest ways to design a space you'll love and will feel so uniquely you. We're still bringing her room together with decisions to make and items to buy, but its shaping up to be so lovely, and I'm excited to create this space for our newest addition that we'll be welcoming in October. I use Pinterest for all my design projects, and pinning images of rooms that I like helps me identify patterns of colors, feel, and design elements that are consistently catching my eye. This helps guide me back to center when I get sidetracked in the design process. Enjoy these room inspiration photos! Would LOVE some input here! Share your favorite in the comments below. Some of the items shared here I plan/hope to get, and some are just for inspiration. 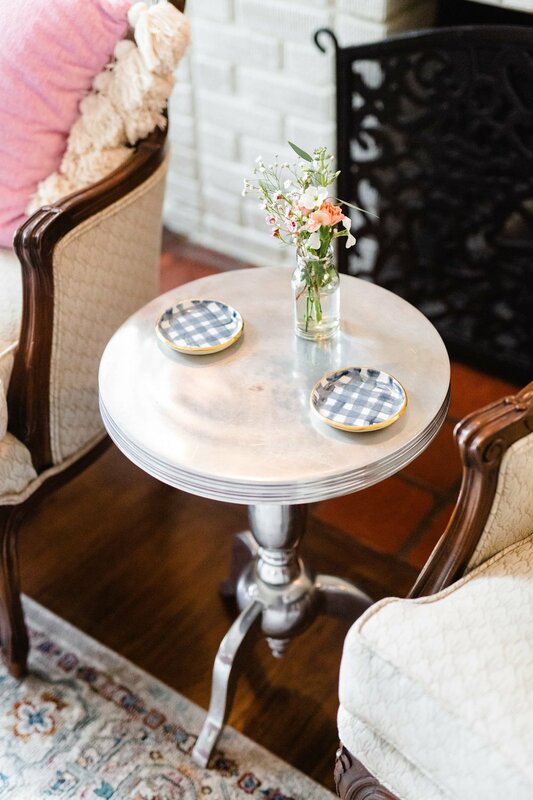 I love taking the time to research and find things I love and then determine if it works with the style of the room, the other items I've already selected, and my budget. 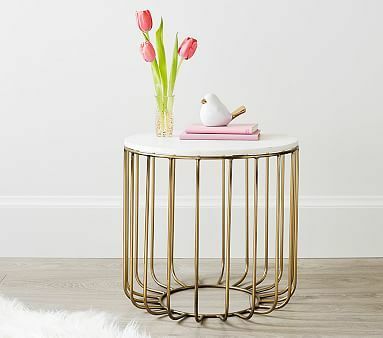 Regardless if a certain item ends up being "the one" it can serve as great inspiration as I shop around, and I've often found great deals at places like Home Goods or Target on items that are so similar to ones I love, but at 1/3 the price! Now, that is a good feeling. I'd love to hear any thoughts or questions you have or brand or item recommendations to share! I grew up with a sister, and I've always been a girly-girl, so when we found out we were expecting a little boy in 2017, I knew it was going to be a new adventure. 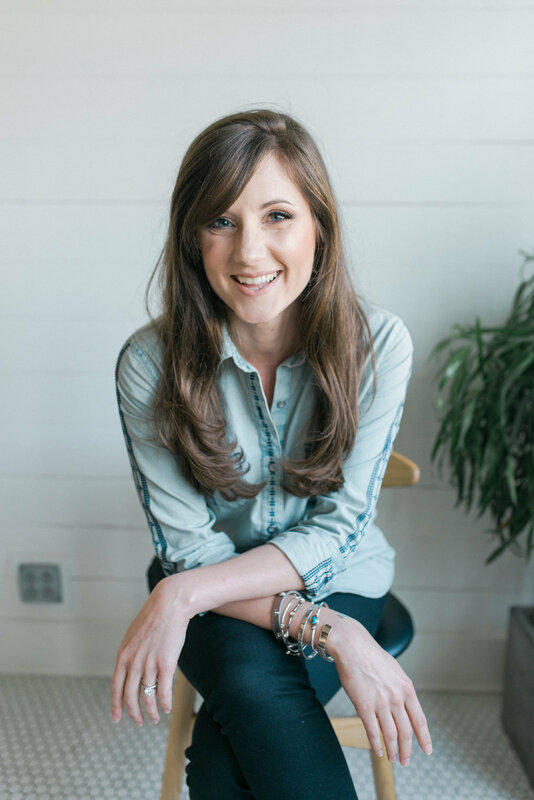 I was excited about it, and honestly, soon after knowing I was a "boy mom" I could feel God starting to uncover new parts of my heart. When it came to the nursery, I wanted to create a space we could all enjoy. It needed to be peaceful, pleasant, perfectly boy, good for a baby, but not so "baby" that it couldn't grow up with him for a few years. I'm naturally drawn to florals and feminine colors, but I think our baby boy nursery is where my love of the color blue was born. There isn't a ton of blue in his room, but I just learned to love so many different shades of blue through the process, and I incorporated them along the way. A space fit for a boy was a design challenge for me, but it was fun to dig deep to bring together a room that would honor our son and be a space where he could feel loved and comfortable. The walls were already gray (SW Repose Gray), so we stuck with that. I loved the white and natural wood of the Babyletto cribs, and this choice set some direction for the room. We ended up accenting the room with wood and neutrals, some pops of kid-friendly color, and blues in artwork and accents. We found the felt cactus at a local art show, the pillow was a gift, the lamp and throw are from Target, the rocker from a local furniture store, Barnett's, and the Peter Rabbit plate is an heirloom from Woody's childhood. I love mixing in new and old, store-bought and handmade, and most of all, meaningful pieces anytime I design a room. I saw the idea for the floating shelves as a bookshelf and loved it. Being able to display the brightly colored books was exactly the kind of pop I was looking for to keep a mostly neutral space fun and kid-friendly. We found our shelves at Ikea. The painting above the crib is by a local Birmingham artist, Jayne Morgan, which I had commissioned as a gift for Woody our first Christmas together. I love the playful images and colors, and having original art in his room was important to me as it is throughout our home. The crib sheets are another fun pop, and the little brown bear was one of my favorite friends when I was little. I really hoped to find a dresser for Fox that he could use throughout his life. I looked for solid wood, classic pieces, but I just could not find one I loved in our price range. So, we ended up going practical and economical with an Ikea dresser. It's worked wonderfully with plenty of space, and I love the look of it, too. His gallery wall is made up of a combination of original art, prints, and a couple architectural pieces. I also adore his Letterfolk board, which we used for his monthly photos. Better than any piece we ever could've found for his nursery, was finally getting to be in that space with him in our arms. We had dreamed about him, talked about him, and carefully curated all his items awaiting his arrival. Getting to finally enjoy the room with that little person that all the preparation was for, was the sweetest part.